Virgin Galactic’s SpaceShipTwo (SS2), slated to become the world’s first commercial manned spacecraft, is undergoing rigorous testing at California’s Mojave Air and Space Port. Christened “VSS Enterprise”, the first in Virgin Galactic’s planned fleet of suborbital spaceplanes is scheduled to complete its first space flight in December, leading to an eventual debut with commercial passengers. Developed from the historic advancements made by the world’s first manned private spacecraft SpaceShipOne (SS1), SpaceShipTwo (SS2) aims to make space tourism more accessible and affordable. While the destination is merely a short, suborbital space flight, the $250,000 per-ticket voyage aboard SS2 is significantly less costly than the tens of millions of dollars required for a flight on Russia’s Soyuz spacecraft, currently the only operational vehicle supporting space tourism. SS2 was crafted by legendary aircraft designer Burt Rutan’s Scaled Composites and is powered using Sierra Nevada Corporation’s RocketMotorTwo (RM2). Key to SpaceShipTwo’s success is WhiteKnightTwo (WK2), a carrier aircraft built by Scaled Composites that lofts the spacecraft for the first 50,000 feet of its journey. Once at altitude, WK2 releases SS2 and heads back to the runway, allowing SS2 to rocket onward into space. While SS2 was first announced in July 2005, the vehicle’s complex development cycle is ongoing. VSS Enterprise’s first glide tests occurred in 2010, prior to the spacecraft eventually enjoying its first powered flight, which took place on April 29 of this year. 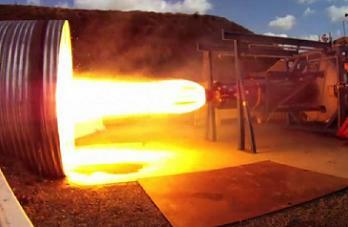 The next major milestone for Enterprise is its first spaceflight, tentatively set for December. In preparation, Virgin Galactic has pressed forward with a series of flight tests of WK2, glide tests of SS2 and hot-fire tests of RM2. In the midst of the test program, Virgin Galactic has trained two respected pilots to join Mark Stucky and David Mackay in piloting the WK2 and SS2. Following a May 7 flight as a co-pilot, retired U.S. Air Force Lieutenant Colonel Michael “Sooch” Masucci took his first command of WK2 for a 1.6 hour training flight on May 8. Space Shuttle veteran and retired U.S. Marine Corps Colonel Rick Sturckow followed suit on May 14, piloting WK2 for a 1.3 hour training flight. WK2’s two most recent flight tests carried its spaceworthy sidekick, SS2, helmed by veteran WK2 and SS2 pilot Mark Stucky, with fellow veteran David Mackay as co-pilot. On July 25, Stucky and Mackay completed SS2’s first flight since April’s powered flight, conducting an 11 minute unpowered glide test. 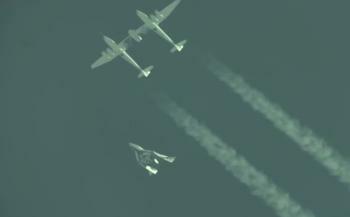 August 8 saw another unpowered glide flight, this time testing SS2’s unique “feathered” configuration, in which the craft’s wings are moved upward to a 65 degree angle. In a spaceflight scenario, this configuration would allow for a high-drag, low-heat reentry which would, in theory, be much safer than more conventional reentry systems. In all, WK2 has flown 16 times since SS2’s first powered flight, including two flights with SS2. On the ground, testing continues on Sierra Nevada Corporation’s RM2. Fueled by hydroxyl-terminated polybutadiene (HTBP) and nitrous oxide, the hybrid rocket engine sends SS2 soaring to space following separation from WK2. Since April’s first use of RM2 in flight, which involved a 16-second burn, Scaled Composites and Sierra Nevada Corporation have conducted two back-to-back hot-fire ground tests using the engine, both on May 17. The first test used an intentionally defective engine to test the RM2 to destruction, providing valuable data on the engine’s performance in an off-nominal scenario. In the second test, engineers conducted an extended burn using a flight-rated engine to prove RM2’s readiness for flight. 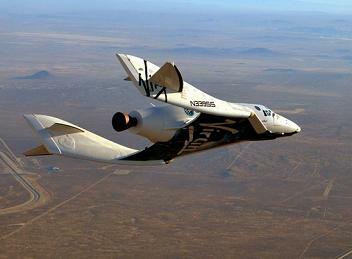 Virgin Galactic plans several further unpowered subspace flights, culminating in December with the spaceplane’s first trip to space. As SS2 continues its march to space, Virgin Galactic, the spacecraft’s operator, has shifted its leadership, appointing Steve Isakowitz as the company’s president. Isakowitz joined Virgin Galactic in September 2011, initially serving as Executive Vice President and Chief Technology Officer. Prior to his work with Virgin Galactic, Isakowitz served as NASA’s Deputy Associate Administrator for the Exploration Systems Mission Directorate and as the Chief Financial Officer for the U.S. Department of Energy. 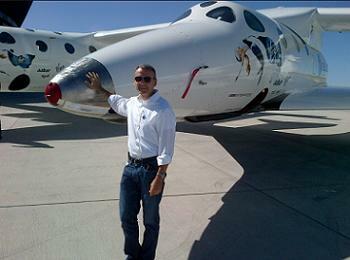 “Virgin Galactic is a transformational company and I am honored to take on this new role. As we chart an exciting course into the future of commercial space travel, I could not imagine a better team with which to do it,” said Isakowitz in a Virgin Galactic news release. Meanwhile, the SpaceShip Company, which is owned by Virgin Galactic and will take over from Scaled Composites in manufacturing future SS2 vehicles, appointed Doug Shane as its Executive Vice President and General Manager. 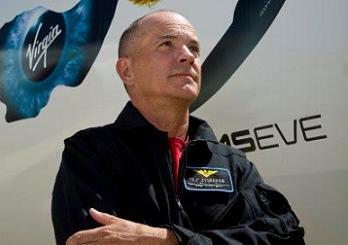 Shane’s experience includes a 31-year tenure at Scaled Composites, where he served as president for five years. As Virgin Galactic ramps up to operating SS2 in a commercial capacity, it is taking steps to build its reputation as a corporate citizen. Galactic Unite is an organization that Virgin Galactic founded to provide science, technology, engineering and mathematics (STEM) scholarships and other education resources to students around the world. In partnership with Galactic Unite, Virgin Galactic is initializing a new program to award scholarships to South African high school students. A company news release stated, “Virgin Galactic and Galactic Unite are thrilled to announce a new initiative, inspired by the great man himself. The premise of Mandela Day is that every one of us has the ability to make a positive impact in the lives of others. While SS2 initially will operate out of New Mexico’s Spaceport America, an intriguing possibility for a second location has arisen due to NASA and Space Florida’s progress toward making Kennedy Space Center’s Shuttle Landing Facility (SLF) available to commercial suitors. Built as a finish line for Space Shuttle Program missions, the SLF provides a ready-made, logical base for suborbital space tourism flights. With XCOR’s Lynx spaceplane and Sierra Nevada Corporation’s Dream Chaser already being considered for operation out of the SLF, the Cape could feasibly become SS2’s second home.